The purpose of this example is to show the features of multivariate denoising provided in Wavelet Toolbox™. where the observation X is p-dimensional, F is the deterministic signal to be recovered, and e is a spatially-correlated noise signal. 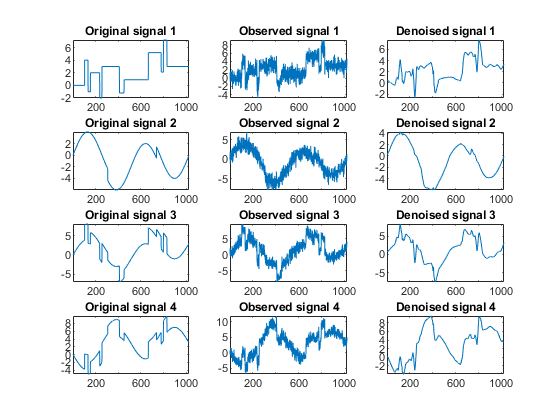 This example uses a number of noise signals and performs the following steps to denoise the deterministic signal. Usually, only the matrix of data x is available. Here, we also have the true noise covariance matrix covar and the original signals x_orig. These signals are noisy versions of simple combinations of the two original signals. The first signal is "Blocks" which is irregular, and the second one is "HeavySine" which is regular, except around time 750. The other two signals are the sum and the difference of the two original signals, respectively. Multivariate Gaussian white noise exhibiting strong spatial correlation is added to the resulting four signals, which produces the observed data stored in x. The denoising strategy combines univariate wavelet denoising in the basis, where the estimated noise covariance matrix is diagonal with noncentered Principal Component Analysis (PCA) on approximations in the wavelet domain or with final PCA. We can see that, overall, the results are satisfactory. Focusing on the two first signals, note that they are correctly recovered, but we can improve the result by taking advantage of the relationships between the signals, leading to an additional denoising effect. The second output argument npc is the number of retained principal components for PCA for approximations and for final PCA. As expected, because the signals are combinations of two original signals, Kaiser's rule automatically detects that only two principal components are of interest. As it can be seen by comparing it with the true matrix covar given previously, the estimation is satisfactory. These results are better than those previously obtained. 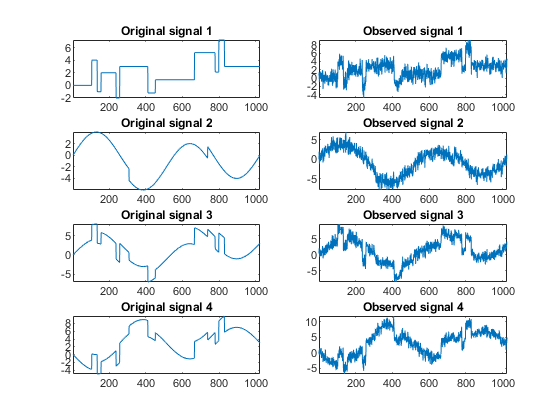 The first signal, which is irregular, is still correctly recovered, while the second signal, which is more regular, is better denoised after this second stage of PCA. M. Aminghafari, N. Cheze and J-M. Poggi (2006), "Multivariate denoising using wavelets and principal component analysis," Computational Statistics & Data Analysis, 50, pp. 2381-2398.